Humanitarian operations are a critical and challenging activity. The general class of problems in this area are distinct from those in business operations management for a number of reasons. Among these are the focus on minimizing suffering and empowering affected populations, the requirement for ethical and just treatment, the complex and often politically charged problem setting, the need for transparency and accountability, the uncertain and dynamic environment, the distinctive decision-making processes of non-profit and governmental organizations, and the existence of unusual resource constraints. 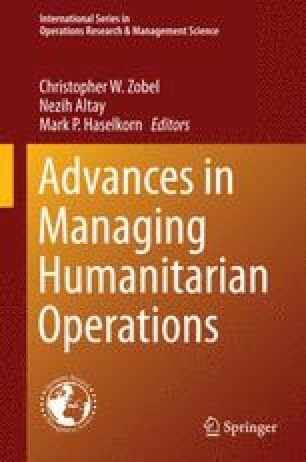 Each of the chapters in this Advances in Managing Humanitarian Operations volume seeks, in different ways, to help us improve our ability to address these problems. This initial chapter emphasizes the importance of the practitioner community to these efforts and it provides a careful overview of the important work contributed to the volume by our many authors.